Our friend Jeannie was coming back from Colorado and she would bring Tyree to NM with her horse. We arranged to meet at the Cienega exit off I-25 and do the transfer. It was Super Bowl Sunday, but our party would be getting Tyree home! My dear friend Tracy came along for the fun, and we excitedly arrived at our meeting place. Tyree came out of the slant-load trailer like he'd done it a thousand times, and went into our old trailer like a pro as well. He had never been in something so confined and never had to back out of a trailer, but we thought he'd figure it all out. Back home, I opened the trailer door and waited for Tyree to back out. Nothing. I decided to open the small side door to see if I could push him back out of the trailer, but instead he lunged forward and the adrenaline started to rush; that door was way too small for anything but a human, but he could have come part way out and maimed or killed himself. He had managed to get his head and chest thru that small opening. Tracy was pushing on the door with all her might. 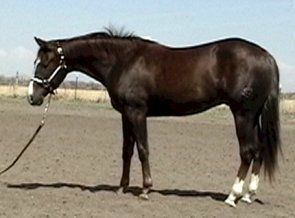 I had Tyree's halter, and was pushing as hard as I could; we were strong and in good shape, but no match for a 1000 lb. young Quarter Horse; Tyree was giving no sign of backing up. Somehow I had managed to get the cellphone out of my pocket and was praying who to phone, when Tom came home unexpectedly and drove right up to where we were struggling!!!! PRAISE GOD FROM WHOM ALL BLESSINGS FLOW!!! He had decided to come home and get the gasoline-saving Volvo to drive to Pecos.......... he had planned a stop in Madrid for a burrito and visiting with the guys, but Len was closed.... talk about a GOD SEND!!!!!! With strong, muscular Tom pushing on Tyree's head and the side-door, I was able to get inside the trailer and pull on the leadrope; Tyree backed out of the trailer, HALLELUJAH!! We got banged up a bit, but nothing serious, and Tryee was calm and cool as if nothing had happened. This was totally my fault, forgetting he was a colt and not used to the trailer and the routine.... forgetting that all new horses must be treated as total nutsoid guys, ready to cause themselves, and you, harm at all times... at least for the first 24-48 hours. I was much too relaxed and nonchalant... BUT THE LORD CAME THRU in spite of my carelessness and I am AGAIN and forever THANKFUL and grateful for HIS amazing grace and mercy!!! Join in and write your own page! It's easy to do. How? Simply click here to return to Guardian Angels Among Us.